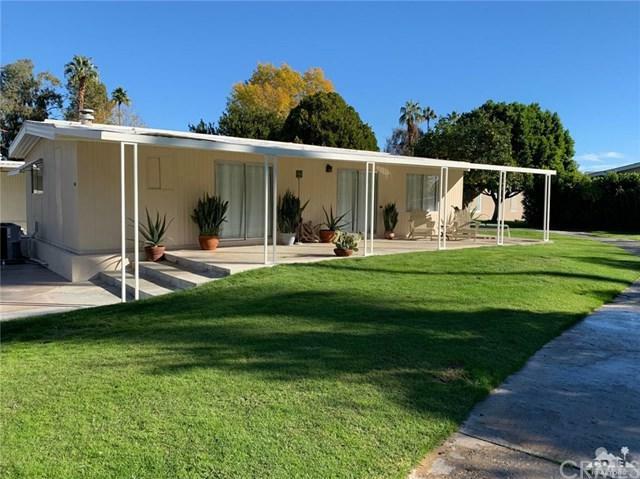 Located in Rancho Mirage in an all-ages community and situated at the end of a cul-de-sac ,surrounded by greenbelt, this Charming home features two bedrooms and two bathrooms. Enjoy amazing Mountain Views from your patio! Freshly painted interior and exterior. Stainless steel appliances including refrigerator, dishwasher, stove, range hood and washer and dryer. Beautiful laminate wood floors throughout the entire home. Wonderful large patio with stunning mountain views. Don't miss this opportunity to live in Rancho Mirage. Lease Land. Space rent is currently $728.00 which includes the sewer, trash bill and water bill. Community clubhouse and two lovely community pools in the development. Close to schools, restaurants, shopping and access to Highway 111. Sold by John Anselmo of Homesmart Professionals. Inclusions Dishwasher Washer Dryer Refrigerator Stove Outside Bbq Patio Furniture And Potted Plants.